← Are Canadian banks trafficking in the digital identities of millions of Canadians? The purpose of this article is to describe the background and rationale for set of proposed extensions to the UBL 2.2 business document specification to make UBL schema better suited for creating distributed business applications on the blockchain. The proposed set of extensions is referred to as the Universal UBL Extensions. 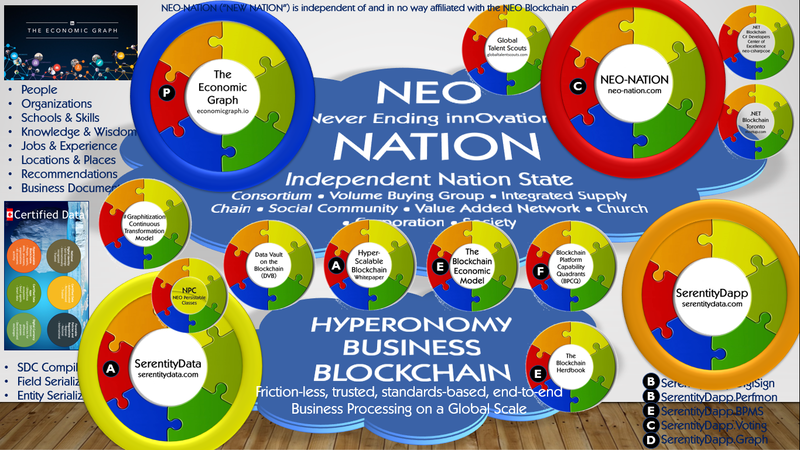 Hyperonomy Business Blockchain (HBB) is a horizontal software applications platform for supporting standards-based, end-to-end, general-purpose, trusted business processing on a global scale. For business document schema, HBB is reliant on the UBL 2.2 (Universal Business Language) specification from the OASIS group. For defining workflow templates, HBB is reliant on the BPMN 2.0 specification from the Object Management Group (OMG). .NET Core Common Language Runtime (CLR) for virtual machine support. The Stratis Full Node is the engine that powers the Stratis blockchain network. A future-proof and environmentally sustainable consensus protocol, which uses a Proof-Of-Stake (PoS) algorithm, drives each Full Node in the network. .NET Core is an open-source, general-purpose development platform maintained by Microsoft and the .NET community on GitHub. It’s cross-platform (supporting Windows, macOS, and Linux) and can be used to build device, cloud, and IoT applications. UBL is an OASIS specification that defines schema for the 81 most common digital business documents used in supply chain or other online commerce scenarios. The current version of the UBL specification is known as OASIS Universal Business Language version 2.2. A suite of structured business objects and their associated semantics expressed as reusable data components and common business documents. A library of XML schemas for reusable data components such as “Address”, “Item”, and “Payment”—the common data elements of everyday business documents. A set of XML schemas for common business documents such as “Order”, “Despatch Advice”, and “Invoice” that are constructed from the UBL library components and can be used in generic procurement and transportation contexts. A key premise of a UBL business document schema is that is complete, standalone, physical representation of the underlying conceptual business or application object. The primary intended purpose of documents conformant with the UBL specification is: electronic document exchange and rendering/printing. An example receiver application is a print facility that can print any instance of a given UBL document type without having to perform any calculations nor need even know the underlying calculation model. For the purposes of this article, the following UBL Invoice schema serves as the primary use case. The first page of the UBL Invoice schema looks like the following. Each one of the 81 UBL business document schema is a complete, holistic representation of a particular business document (e.g. Invoice, Business Card, Bill of Lading, Order, Request for Quotation, Forwarding Instructions, etc.). Universal UBL (UUBL) is a set of extensions to (or superset of) the UBL 2.2 specification that provides enhanced support for storing and interacting with digital business documents on a digital identity/general-purpose blockchain hybrid applications platform. The UUBL extensions are an answer to the 4 blockchain requirements outlined in the previous section. By definition the UBL schema definitions are both complete and monolithic – they completely description a particular digital business document in its entirety. For storage on a blockchain and for direct reference by (a) code running in a traditional smart contact or (b) a new generation of business process workflow templates running directly on a workflow-engine-based virtual machine, the potentially large size of a typical, monolithic UBL business document makes them prohibitively large and prohibitively expense to store, process, and manage on a typical general-purpose programmable blockchain. A replicable solution for refactoring/normalizing/decomposing each UBL document schema into a collection of subentity schema is need. A solution is proposed by the author in the section Universal UBL: Extensions for the Blockchain. Closely couple with Requirement 2, is the re-use of existing subentities wherever and whenever possible to conserve space and eliminate replication and redundancy wherever and whenever possible. Backing this requirements is the knowledge that most every-day business documents (i.e. those representable by the 81 UBL business document schema) are in fact permanent (subject an organization’s retention policies), immutable, constant-valued documents once they are created. The simplest example is Waybill. Once you have created your (Federal Express or DHL) Waybill, it is a permanent, immutable, constant-valued business document once it has been created and printed (and is not destroyed before it is used). Given these characteristics of business document in general (and UBL business documents in particular), business documents represent a proper subset of a broader class of entities called Non-Fungible Entities (or NFEs). Another significant class of NFEs are NFTs (Non-Fungible Tokens) …of which, the Ethereum-based CryptoKitties are the penultimate example. The author’s thesis is that, given business documents stature as NFEs, business documents (and NFEs generally) can be implemented and best managed using the emerging digital identity, in particular the self-sovereign identity (SSI) platforms, that are “coming to market”. The best platform, from amongst these, in the author’s opinion, is the Hyperledger Indy SSI software platform operated under the stewardship of the Sovrin SSI governance framework. This set of adjectives, plus a few others, symbolize and capture the essence of the intersection between the world of digital business documents and the world (sometimes what I call the religion) of the blockchain. It is in this intersection between digital business documents and the blockchain that the greatest opportunities lie for supporting friction-less, trusted, standards-based end-to-end business process on a global scale. The following sections detail the envisioned solution for each of the above 4 requirements. The goal of the serentitydata project is to provide support the design and development of enterprise and Internet class distributed applications using blockchain technologies. This includes tools and libraries (code), frameworks, how-to documentation, and best practices for enterprise distributed application development. The serentitydata project has a specific focus on the robust and efficient design and management of immutable, historized, and auditable data stored on a blockchain. Solution: Refactoring/Normalization/Demposition of UBM 2.2 Schema into Subentities Supported by the W3C DID (Decentralized Identifiers) Specification. I’ll take on the answer … this is the area of my contribution to the project. I’ve copied Michael and Larry just for their curiosity as I think they’ll find this discussion interesting. * Is there a standard/recommended/off-the-wall way for a specific Invoice to specify the value of AccountingSupplierParty. PostAddress by reference …instead of “by value” (i.e. instead of the long-hand, replicated approach seen in the example)? Of course it is necessary to point out to other documents, but there is, say, no XPath or other addressing mechanism built into the UBL serialization to accommodate shared fragmentation. The UBL committee has been standardizing a semantic library of the business documents and their business objects, and a number of syntactic serializations of those semantics have been specified, XML being the only normative one. Others in ASN.1 and JSON are available, but they are not normative. 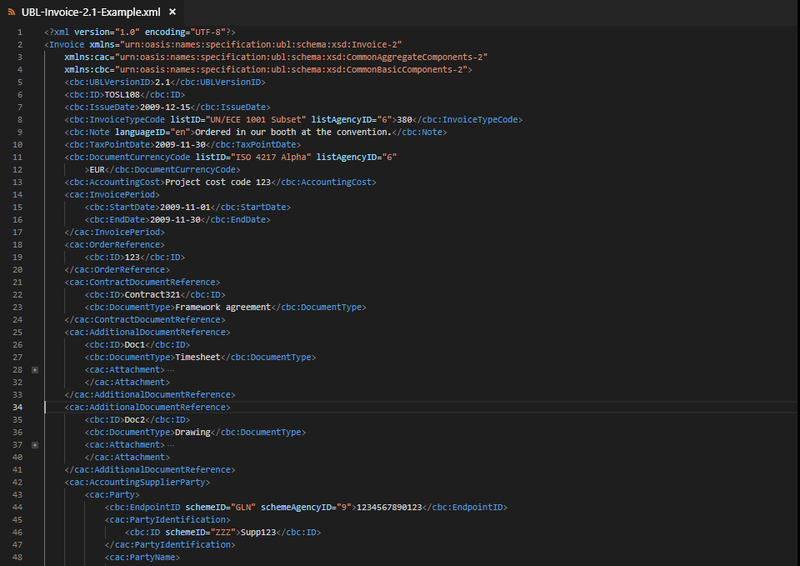 * What does/would an acceptable XML “syntax” look like/might look like? I would use XPath for addressing a point into an XML document. XPointer would be used if you wanted to point to a range of items found in an XML document. Within an XML document I would use ID/IDREF, but those properties are not available in UBL. Not many people realize that UBL was not built using XML/XSD, it was built using CCTS. CCTS doesn’t have ID/IDREF concepts. * Is there standard terminology for referring generally to a subcomponent/subelement of an Invoice (or any other) UBL document? I’m currently using the term Fact to refer to each of the subcomponents (applied recursively if necessary)? No such terminology is used within the committee … such a concept isn’t leveraged because the syntax is but a straightforward manifest serialization of the semantic components. This is best for interchange between independent platforms and also for things such as rendering. A recipient of a UBL document should have everything they need without needing to calculate anything … the calculus of the values cannot be assumed to be known by the recipient. UBL documents are conceived for the purpose of interchange between disparate systems to replace existing trade documents. The SerentityData Entity Serialization and Field Encoding library fulfills Blockchain Requirement 1 for the Universal UBL (UUBL) extensions to the UBL 2.2 business document schema specification. The SerentityData Entity Serialization and Field Encoding description has been moved to its own article located here: SerentityData Variable-byte, Statistically-based Entity Serialization & Field Encoding.